Cycling to university or college is a great way to save a few pounds each day to put towards books for your studies, or even a treat at the weekend! But aside from the financial advantages there are also plenty of health benefits from cycling each day. Even if you only plan to cycle a few minutes to college it’s vital that you understand how you can stay safe on two wheels. Just because you’re not driving it doesn’t mean that you don’t have to obey the rules of the road or be aware of your surroundings. The biggest concern for cyclists should always be heavy good vehicles (HGVs) and other large vehicles such as buses and lorries. In fact, research from from a bicycle injury specialist indicates that around 80% of cycling fatalities are caused by HGVs turning left at a junction and colliding with a cyclist. 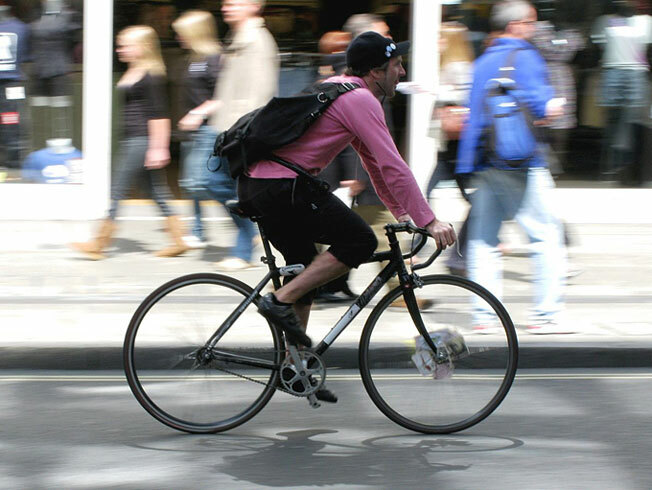 Whenever you cycle it’s hugely important that you ensure that you are fully visible at all times, especially in heavy traffic and when around larger vehicles. Remember, if you can’t see the driver’s face then they won’t be able to see you either! Cycle Claim Line warns that large vehicles often have a substantial blind spot that cyclists should take into account when around HGVs, trucks and buses. When at traffic lights it is recommended that cyclists move ahead of the traffic to ensure that they have been seen, especially when in front of HGVs as the driver is often perched high above the traffic and may not have a clear view of what is directly in front of their vehicle. Moving forward and making eye contact alerts other road users to your presence and is a good habit to get into. Cycle Claim Line recommends that cyclists are fully aware of their surroundings, especially when approaching junctions. Even if you are in the cycle lane, don’t be tempted to just carry on regardless as other vehicles may suddenly enter the cycle lane or turn in front of you. Again, HGVs should put cyclists on alert in this situation. As these vehicles have a much wider turning circle than other road users, it can sometimes appear that they are headed straight rather than turning left. It’s best to hang back and wait to cross the junction before passing traffic. Don’t worry about being late for your lecture, just make sure you get there safely! Even if there is minimal traffic, cyclists should always be alert for pedestrians crossing the road or passengers suddenly opening car doors – this is one of the most common causes of collisions. To ensure that you stay safe, you should cycle at least a metre from the kerb and any parked vehicles, this should give you more time to avoid any hazards. You should maintain your bike throughout the year but it is absolutely essential during the winter months. In icy conditions you may want to upgrade to thicker tyres which provide improved grip on the road – this also reduces the risk of sliding and helps you to maintain your balance therefore reducing the risk of accidents. Ensuring that your bike’s brakes are in perfect condition is vital too. 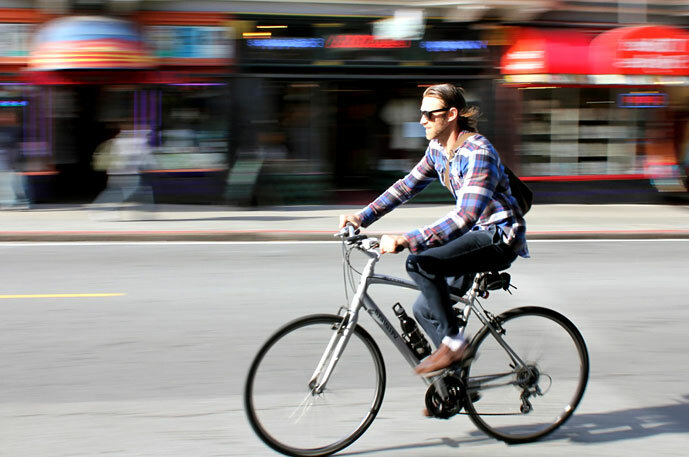 Like cars, a bike’s braking distance is affected by the weather and road conditions. When it’s wet or icy, you will need to ensure that you are able to stop as quickly as possible to avoid any potential hazards. Of course, you will need to check the weather forecast to ensure that it is safe to be out on the roads. Sometimes the conditions will make cycling too hazardous so it is important to be aware before you set out. 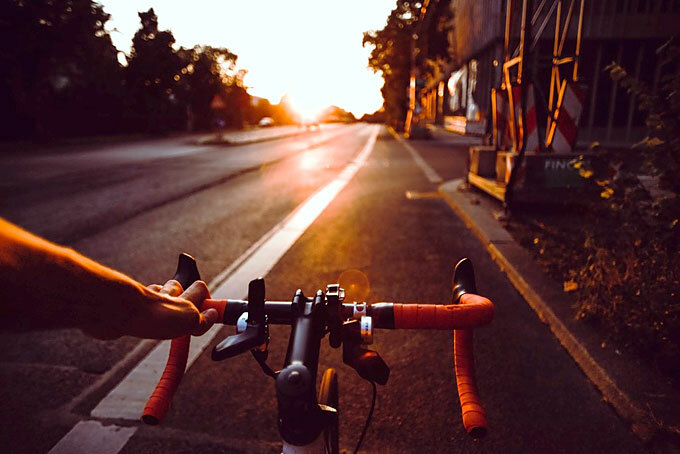 If you’re a little nervous about cycling through traffic, it is always a good idea to consult apps or websites such as CycleStreets which ensure that you can find a more pleasant route to uni so you can avoid the worst of the traffic and enjoy a stress-free ride.